The burned out car found on a slope in a suburban area. 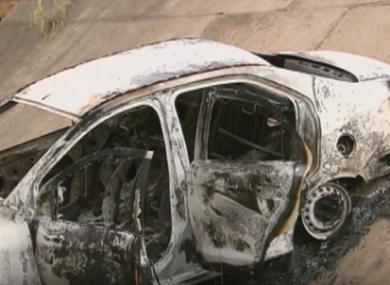 THE DISCOVERY OF a burnt-out car in Rio state with a body inside have sparked fears that it might be that of the Greek ambassador to Brazil, missing since Monday. “The information that we can confirm right now is that we have found a car in (the district of) Nova Iguacu with a body and it is being investigated,” a source in the homicide squad told AFP. The source would not say whether the licence plate of the car was from the rental the ambassador was using, nor when DNA results on the body would be back. Amiridis had been on vacation with his family in Rio de Janeiro’s northern Nova Iguacu area since 21 December. He was due to fly back to Brasilia on 9 January, a Greek embassy official told AFP. But he went missing on St. Stephen’s Day night, after going out of the apartment they were renting and taking the car, according to Brazilian media. His Brazilian wife formally declared him missing on Wednesday. A Brazilian news website published photos of the burnt-out car found on the slope of a busy suburban thoroughfare. It reported that police “suspected” the body inside to be that of the ambassador. Amiridis was named ambassador this year. He had previously served as Greece’s consul general in Rio from 2001 to 2004. He served as Greece’s ambassador to Libya from 2012 to 2016. He is married and has a daughter, according to the embassy in Brasilia. Email “Body in burnt-out car in Rio feared to be Greek ambassador”. Feedback on “Body in burnt-out car in Rio feared to be Greek ambassador”.